The Minor Basilica of the Immaculate Conception in Batangas City. Image source: Eric Jam - Own work, CC BY-SA 3.0, https://commons.wikimedia.org/w/index.php?curid=33151104. From the document “History and Cultural Life of the Poblacion1” (of Batangas City), we get a historical snapshot of the by-now Minor Basilica of the Immaculate Conception in Batangas City. This document is one of many solicited by the administration of President Elpidio Quirino in 1951 from Department of Education districts around the Philippines to reconstruct local histories destroyed during the war. Most of these so called “Historical Data,” as they are filed away at the National Library of the Philippines Digital Collections, were transcribed from recollections of old men and, thus, need to be taken with a grain of salt. Moreover, very few cited verifiable sources. In this short history of the minor basilica, therefore, we cite supposedly historical facts from the source document but at the same time attempt to verify these from other published documents. The first church in the small pueblo of Batangas, humbly made with bamboo and nipa, was supposed to have been built in 1581. It was dedicated to the Immaculate Conception. The date given is just about right. Although there were inhabitants of the area now known as Batangas City even before the arrival of the Spaniards, the formal establishment of the pueblo itself – as Christian communities were known in Spanish colonies2 - was not done by Augustinian missionaries until the year 1580. I am unable, however, to verify that such a priest ever existed in several Spanish-language documents that I consulted. If at all, he likely arrived with a group of 24 Augustinian missionaries which arrived from Spain in 15755. A fire was supposed to have gutted the old church, which was built with flimsy materials; but after 1672, the foundations for a new stone church were laid. The nave, “the central part of a church building, intended to accommodate most of the congregation6,” was supposed to have been completed in 1686. This is contradicted by the earlier mentioned Wikipedia item which says that the foundations only started to be laid down this same year. Back to the source document, the crucero or transept, the “arms” of the nave, were supposed to have been added in 1706. The entire church was completed and given a “solemn benediction” in 1721. Although the small church, “built entirely by the Fathers,” had to withstand several earthquakes in the ensuing years, no significant damage was ever recorded of its structure. By 1851, the population of the town of Batangas had grown to the extent that a new church became a necessity. There was understandably some opposition to building one, given that many of the town’s inhabitants were impoverished, but the new parish priest, one Fr. Pedro Cuesta, was determined to build one. After six years of construction plagued by many challenges, the new church was finally blessed in formal ceremonies held on 2 February 1857. It was damaged by an earthquake on the first of October 1869. This is likely correct, although Wikipedia says 1863, because there was, indeed, an Intensity VIII that affected provinces east and south of Manila7. The damage was quickly repaired and the church’s exterior was strengthened with buttresses or stone supports. The church was dedicated to the Purisima Concepcion de la Virgen Maria or the Most Pure Conception of the Blessed Virgin Mary. In 1937, under the leadership of the Reverend Monsignor Cirilo Castillo, the church tower was rebuilt. Its façade was destroyed by a powerful earthquake in 1942. There was a recorded Magnitude 7.4 shaker that struck west of Mindoro on 8 April8; however, United States Army Signal Corps records say that the earthquake occurred on 8 May that year. The damage was repaired in 1946, already after World War II, under the leadership of the Rev. Monsignor Domingo Librea. 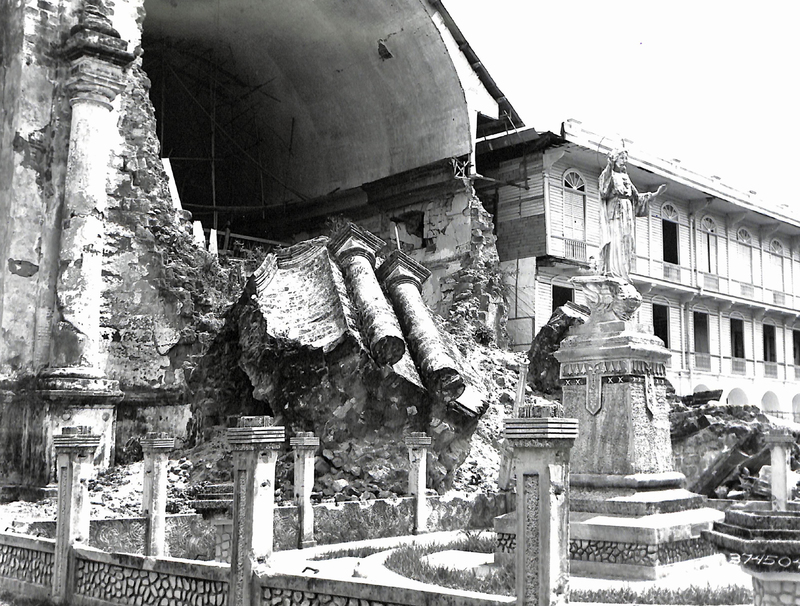 A US Army photo shows a large block of stone that fell from the church because of the 1942 earthquake. Image source: United States National Archives. By virtue of a decree issued by the Holy Father, Pope Pius XII, the Catholic church of Batangas was elevated to the status of “Basilica Minor” of the Infant Jesus and the Immaculate Conception. It was the first church in the entire Philippines ever to be granted that status by no less than the Holy Father himself. 1 “History and Cultural Life of the Poblacion (Batangas City),” online at the National Library of the Philippines Digital Collections. 2. “The Structure of Pueblos de Indios in the Philippines during the Spanish Colonial Period”, by Luis Ángel Sánchez Gómez, Madrid 1989. Online at Academia. 3 “Minor Basilica of the Immaculate Conception (Batangas City),” Wikipedia. 4 “Mojica History, Family Crest & Coats of Arms,” online at House of Names. 5 “Augustinian Province of the Most Holy Name of Jesus of the Philippines,” Wikipedia. 7 “Catalogue of Violent and Destructive Earthquakes in the Philippines,” by Rev. Miguel Sanderra Maso, S.J., published 1910 in Manila. 8 “List of earthquakes in 1942,” Wikipedia.